Blaine started her wellness journey when she became a certified group exercise instructor and personal trainer in 1991. Over the next two and a half decades she immersed herself in a healthcare career while teaching others to live active, healthy lifestyles and competing in running races and triathlons including 30+ marathons and 4 Ironman triathlons. Blaine also became a certified holistic health coach in 2012. After significant soul searching and meditation, Blaine decided to leave the corporate world and create a space where her community can gather to work on physical, mental and emotional growth in a safe, fun and supportive environment. Blaine opened Yoga Hive Colorado in 2017. 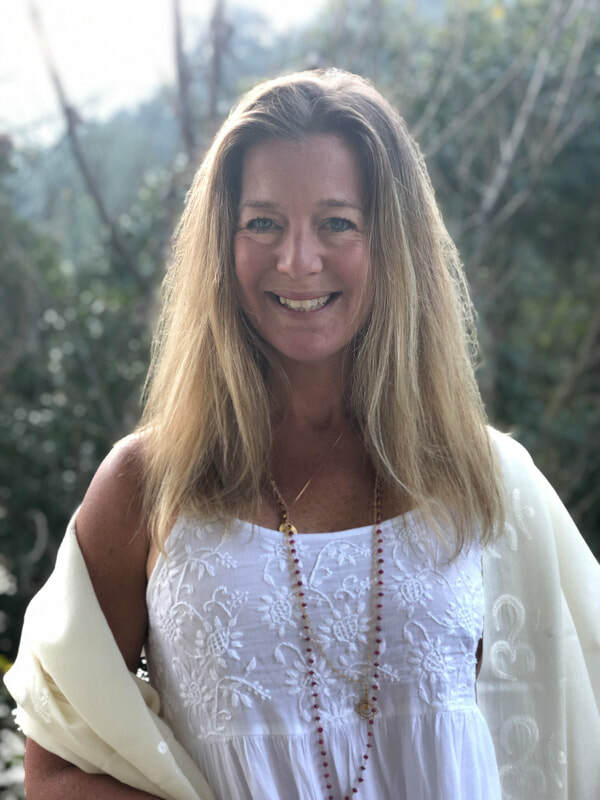 She is a registered yoga teacher (RYT 500), certified Energy Medicine Yoga teacher, certified aerial yoga teacher, meditation coach, and is currently spending 18 months studying Energy Medicine Yoga with Lauren Walker to become an Energy Medicine Yoga Master Teacher. Passionate about fitness, Blaine is a certified Group Fitness Instructor by American Council on Exercise and continues to pursue education in yoga, energy medicine. fitness, nutrition, meditation and wellness. Hannah's love for yoga blossomed in the backwoods of Maine, where she was born and raised. After earning a B.A. in Creative Writing at the University of Maine, in 2012 she moved to Boulder, CO. Finding Silks Yoga literally turned her practice upside down. In the silks, she found both freedom and safety. The yoga studio became her second home. Becoming a teacher of Silks Yoga was the most natural next step for her. In July of 2017, she completed Silks Yoga Training. In her classes, Hannah encourages students to connect mind, body and spirit through the physical practice of asanas, breath work and the incorporation of essential oils. She believes the energy we cultivate on our mats transfers directly to our lives off the mat. She also believes in the power of embracing your inner child - so don't be surprised when she queues you to play! Originally from Washington State, Jules moved to Colorado in 2013 and has really been embracing the lifestyle. She enjoys hiking, snowboarding, green chili burritos and Yoga, of course! She completed her first Vinyasa teacher training through Figure Yoga and is now also certified in Aerial Yoga. Jules enjoys utilizing her background in dance to create colorful sequences accessible to everyone. Her upbeat classes allow students to try new things and expand their horizons in a safe, fun environment. She believes that every new experience in life is an opportunity to grow. Come and grow with her at Yoga Hive Colorado! Laura Zeigler has taught yoga to adults and kids since 2010. As a graduate of Naropa University, she studied yoga, meditation, contemplative education, aikido and Sanskrit. Before yoga, Laura taught preschool and has worked professionally with children for over 15 years. By practicing and teaching yoga, Laura has seen what a potent, life-changing tool it is and her desire to help others discover this continues to fuel her passion to teach. She believes in employing multiple forms, allowing students to discover their own inner teacher. In 2014 she was certified to teach AcroYoga and is particularly excited by it because she loves practicing in community. Through AcroYoga she discovered Thai massage, which continues to deepen her understanding of both physical and spiritual anatomy as well as her practice of conscious, healing touch. She is grateful for the opportunity to enrich her community by teaching mindful Yoga and AcroYoga classes for kids and teens, adults, and families. When she is not on the mat teaching or practicing, you can find Laura spending quality time with her family, working at yoga and music festivals, or upside down in the park - either on her hands or someone else’s feet! Susan is passionate about yoga, aerial yoga, and aerial fabric to develop balance, flexibility and strength. Yoga inspires her to live each moment more mindfully. She is grateful to share her passion and create space for students to grow both on and off their mat. She encourages exploration of the relationship between challenge, playfulness and grace to bring greater awareness to breath and movement. She is dedicated to a life of learning, and forever thankful to all her students, who are also her teachers. She is a RYT with Yoga Alliance. She completed Aerial Yoga teacher trainings with Unnata®, and with Rebekah Leach at Aerialworks. She studied Aerial Fabric, Rope and Trapeze with Sarah Bebe Holmes of Paper Doll Militia and Lei Lei de Kirby of Levity Aerial Yoga. She continues to study Aerial Fabric and Sling at Frequent Flyers and Gravity Aerial Arts. Madeleine is a yin and vinyasa yoga instructor. She was introduced to yoga in 2007 as means to manage anxiety and PTSD resulting from childhood trauma and took to its meditative and emotionally clarifying benefits right away. In 2012 she enrolled in a teacher training program in Minneapolis, MN. and soon after had an accident that resulted in an injury that set her on a yogic path of self exploration. Using Yoga as part of her injury recovery she learned the importance of regular practice, adaptation, modification, body awareness and self care. In 2013 she was struck by a car while riding a bike and sustained many bone fractures, muscle tissue damage and most disruptively a traumatic brain injury. Yoga served as her saving grace during both the physical and mental recovery, giving her strength and teaching her patience and many lessons along the way. In 2015 she completed her 200(+30) hour teacher training where she was trained in Vinyasa with flow, Hatha, Ashtanga and power flow influences as well as guided meditation. In 2016 she found her passion in Yin Yoga and completed a 40 hour teacher teacher training in Boulder, CO.
Yoga has deeply enriched her life and it has been her dream to share what she has learned to help others use yoga to create space and balance within their own lives. She aims to create a supportive space, encouraging actions that are healthy and safe and guides against anything that causes pain or any actions that would harm. She believes that each person shows up on their mat for uniquely different reasons with uniquely different bodies and uniquely different needs and wants to empower students that they may tune into their own inner wisdom to discover what their individual needs are and adapt their practice in a way that serves them best. Madeleine’s yin classes are meditative with emphasis on breath, body awareness, relaxation, self-love and self-care. Her vinyasa classes are set to music you can flow to, encourage you to stengthen the mind-body connection through pranayama/breath work, challenge you to push your edge and are adaptable and accessible to practitioners of all levels. Debbie Whitman is from the Midwest and has lived in Denver since 1988. She is a certified Aerial Yoga and Barre Above instructor. She has a passion for fitness and has been a practitioner of Pilates, Cycling, Running and Yoga for many years. A few years ago, on a whim, she decided to try Aerial Yoga as a different form of fitness. There was an immediate connection. She found a great way to build strength, agility and flexibility in to her Fitness practice. Through her Yoga practice she found a physical connection but also found her breath, energy, presence and focus. This brought a vitality to her life that she wanted to share with others and it is where her Yogic journey began. Her goal, as an instructor, is to bring this experience to her students. To challenge and help them accomplish physical goals while connecting and focusing on the entire practice of Yoga. When Debbie is not focused on yoga you will find her outdoors, hiking, cycling, gardening or in the kitchen creating and cooking, which is another one of her passions. Adi Jiwan believes deeply in the power of Kundalini Yoga and Meditation to transform lives and her mission is to bring the tools and technology of this practice to those who need it most. Her classes are focused on helping students tune into the potential within themselves. She graduated from the Level 1 KRI Teacher Training hosted by Raj Yoga in April 2018 and she holds a Bachelor's degree in International Development, and a Master's Degree in Nonprofit Management. She has spent more than a decade working to empower women in some of the most remote and impoverished communities in East Africa and she looks forward to one day bringing the tools and technology of Kundalini Yoga and Meditation back to those communities and many more around the world. For Cat, yoga has been a powerful tool in emotional healing and building a positive relationship between mind and body. She encourages her students to use stillness and space to explore their interior landscape and sit with what they discover there. Cat has completed trainings in flow, aerial silks, yin, restorative, pre/postnatal, and adaptive yoga. Working from a trauma informed perspective, she is passionate about making yoga accessible to everyone regardless of where they find themselves physically or mentally. Her teaching sparks students' curiosity about their patterns of daily holding and challenges them to break those patterns by moving in dynamic and playful ways. Cat views stepping onto a mat as an opportunity to check in with and then listen to every part of yourself. Intentions, anxieties, fears, and desires are constantly shifting in big and subtle ways- the dialogue never ends. As a teacher, she is simply there to hold space for that conversation.